From installing fibre-optic cable to setting up turnkey networks and testing existing technology, Australian FibreOptic Solutions (AFOS) has a successful background in data communications ranging from small networks to major government infrastructure projects. Australian FibreOptic Solutions is a rapidly growing company in the communication technology industry in Queensland. A Brisbane-based business which began operations in 2003, AFOS has significantly expanded its operations and is now a “one-stop-shop” for a variety of professionally delivered information technology solutions. Amongst its clients are some of the largest major telecommunications contractors and carriers in Australia. 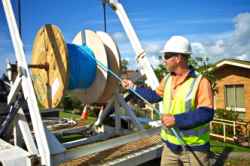 These clients depend on Australian FibreOptic Solutions’ ability to deliver promptly and professionally to connect their business to the world.